A friend from the village has decided to join B in playing rugby for Kirkby, which means I now have someone to share lifts with. Presented with a first opportunity to miss a game and have a day off, I dithered; B has been playing for several years and I’ve missed very few games. I enjoy the matches and recently the team has hit a rich vein of form. On the other hand, the forecast wasn’t too bad and the hills beckoned. I was torn, but you can see which outcome eventually won. 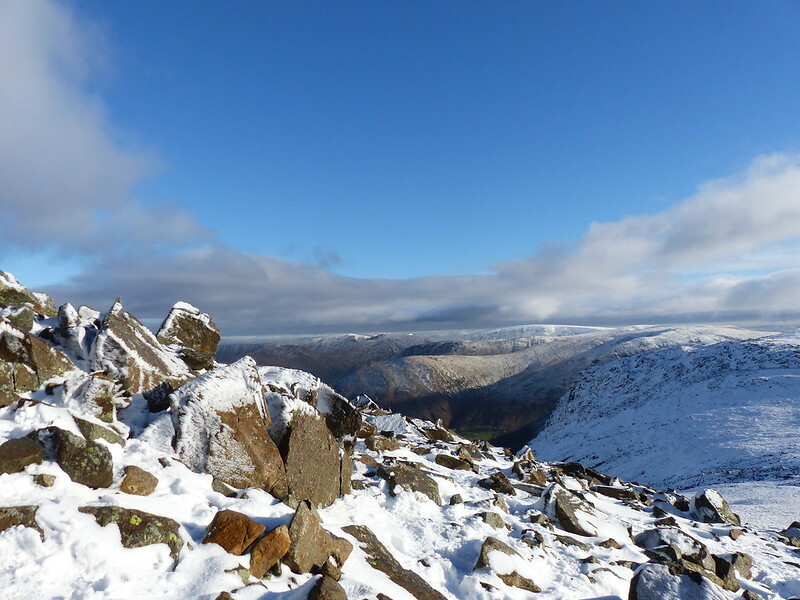 Heading towards the ridge, Sweden Crags, Low Brock Crags and High Brock Crags on the skyline before the snow. 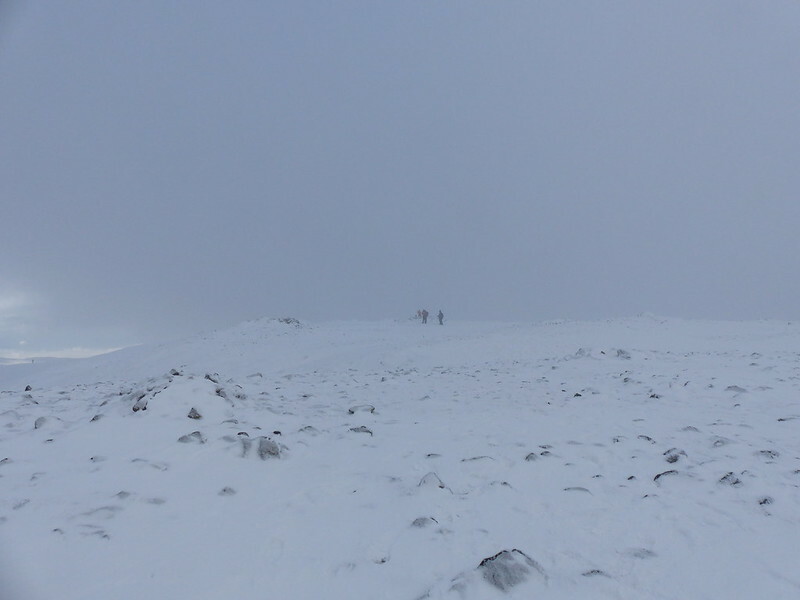 High Pike behind. 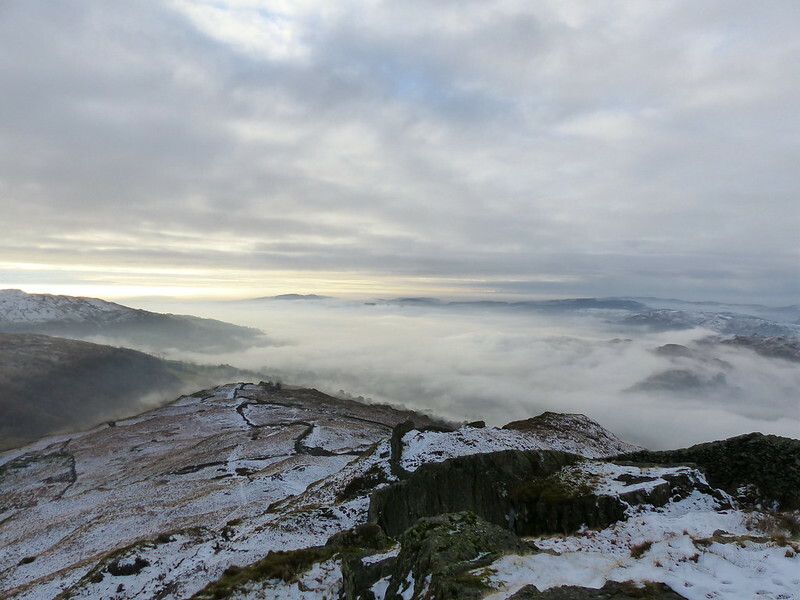 I was out early, partly because one of the forecasts I looked at suggested clear skies around dawn and also because I discovered that certain Lake District carparks cost just a pound for the day, if you arrive before nine in the morning, including the Lake Road carpark in Ambleside. 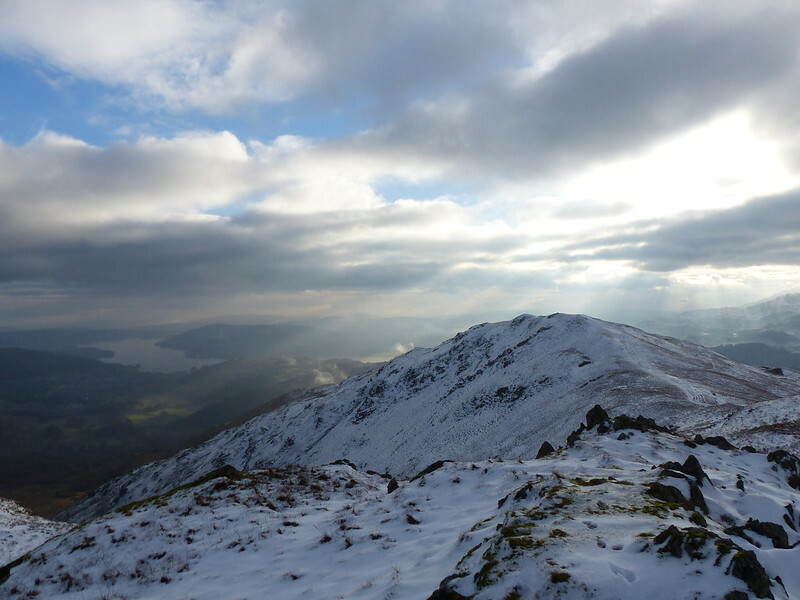 The Fairfield Horseshoe must be one of the best known and most popular walks in the Lakes. Even early on a cold, wintery day, with a mixed forecast, there were a few people about. In actual fact the weather was much better than any of the forecasts had suggested. 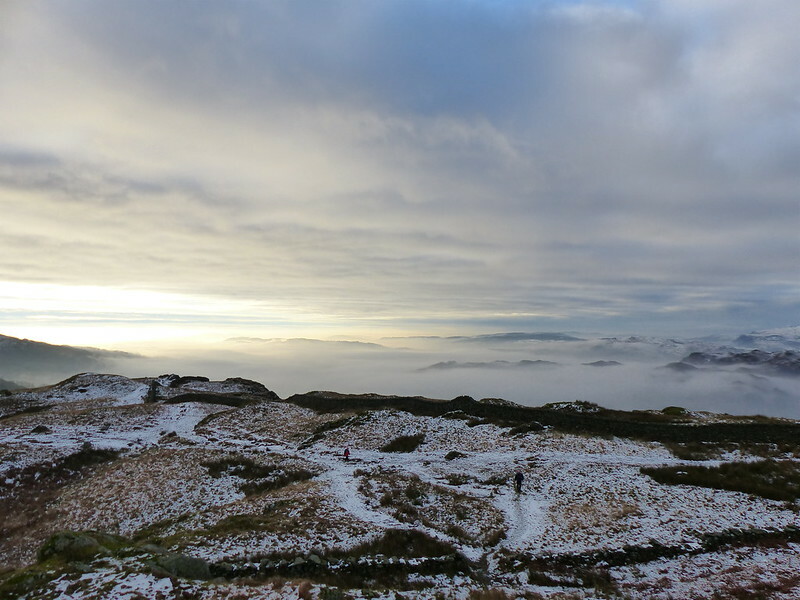 The weather did eventually deteriorate, but not before some marvellous views over a mist covered Windermere and then a spell of glorious sunshine. Even when the weather worsened, the clouds veiling and unveiling the hills and the light shining through gaps in those clouds and spotlighting parts of the scene were dramatic. 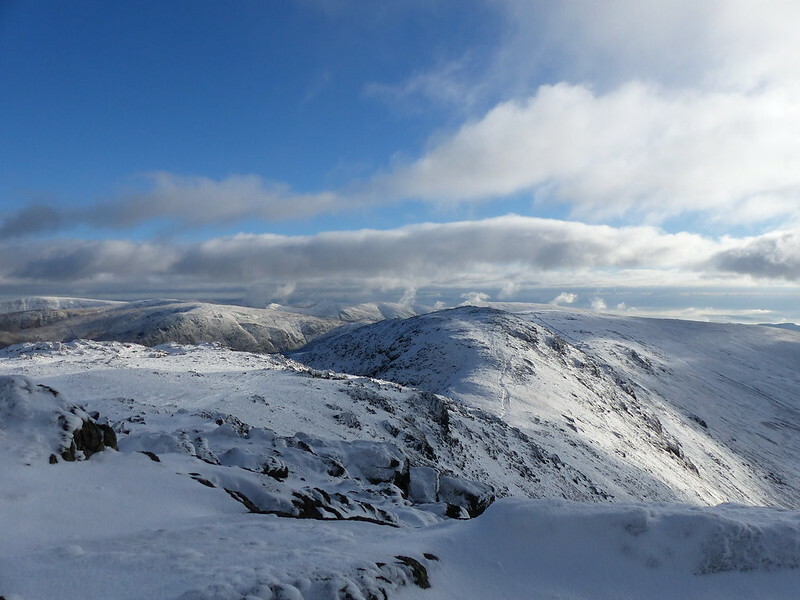 From Low Pike. Another view over Windermere. 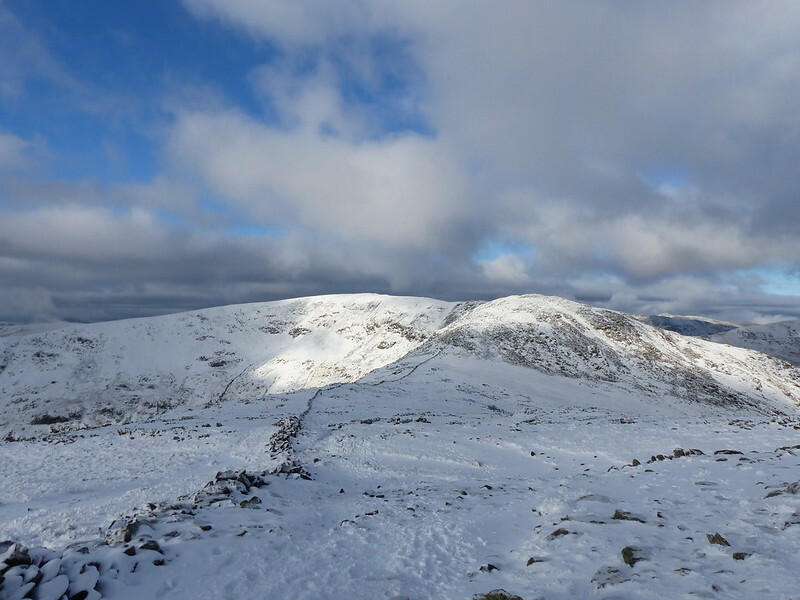 High Pike from Low Pike. 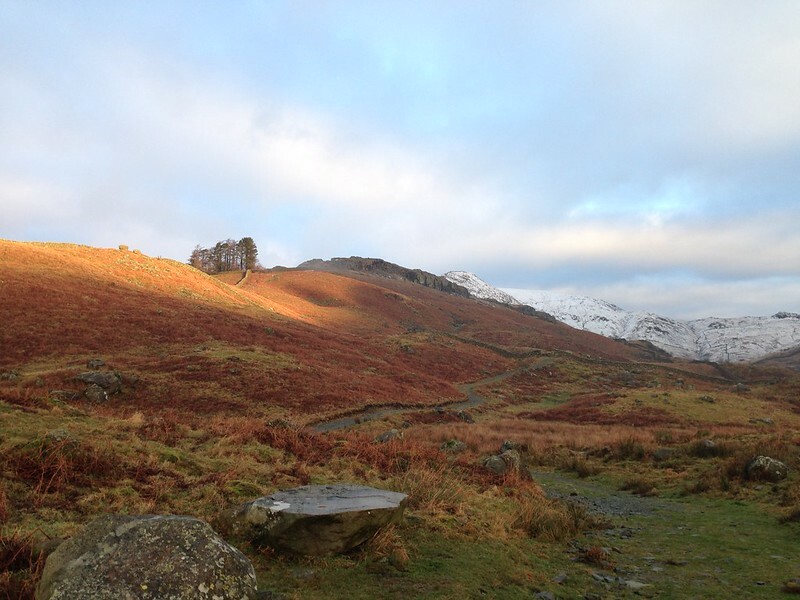 Heron Pike, Rydal Fell and Erne Crag catching the sun. I would be on the ridge later, but without much sunshine. 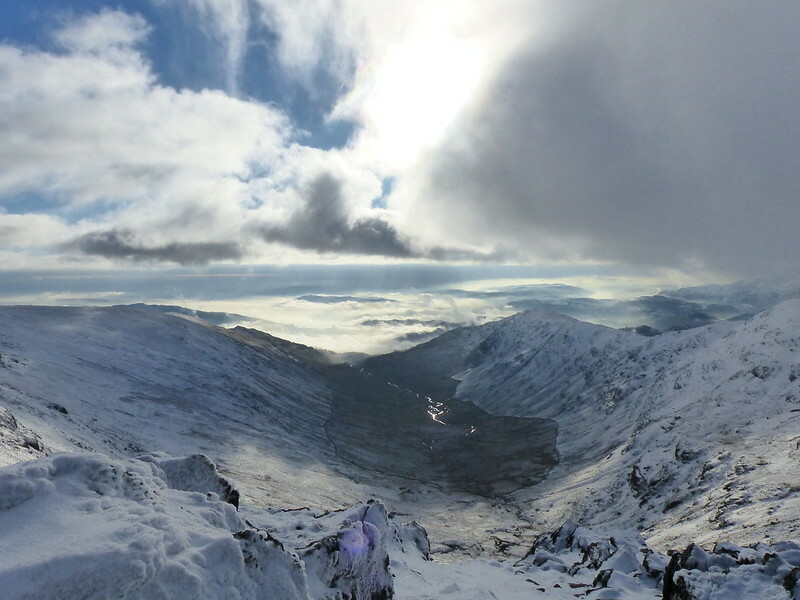 Low Pike, Scandale and Scandale Beck from the High Pike ridge. Heron Pike and Rydal Fell again. 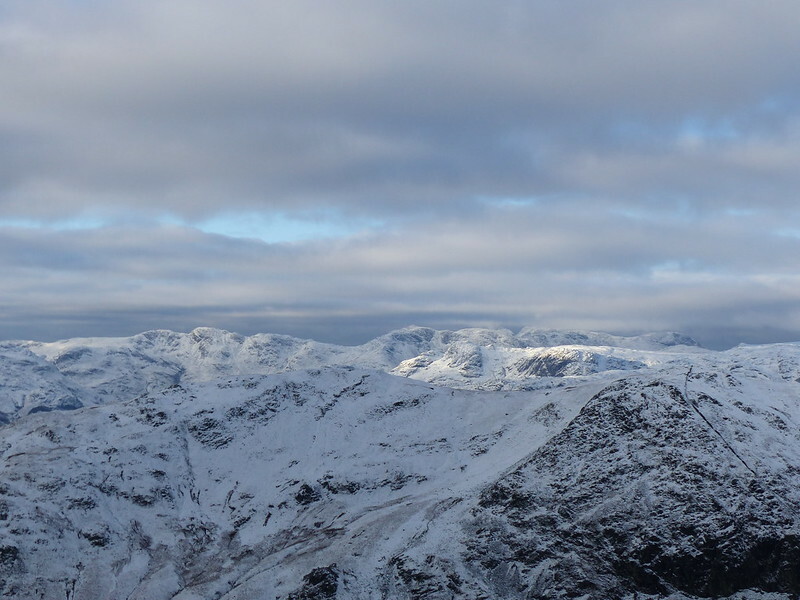 Scafells and Langdale Pikes beyond. 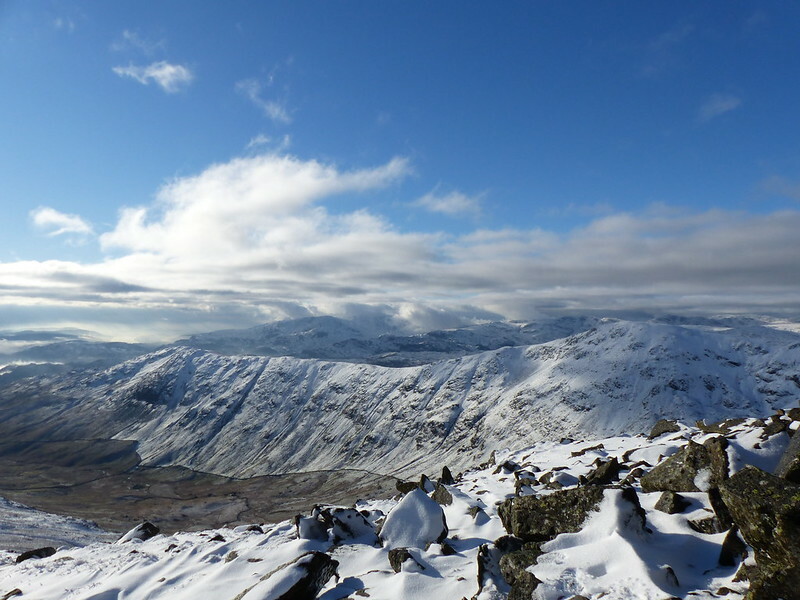 Coniston Fells. A great view of the horseshoe I walked quite recently. 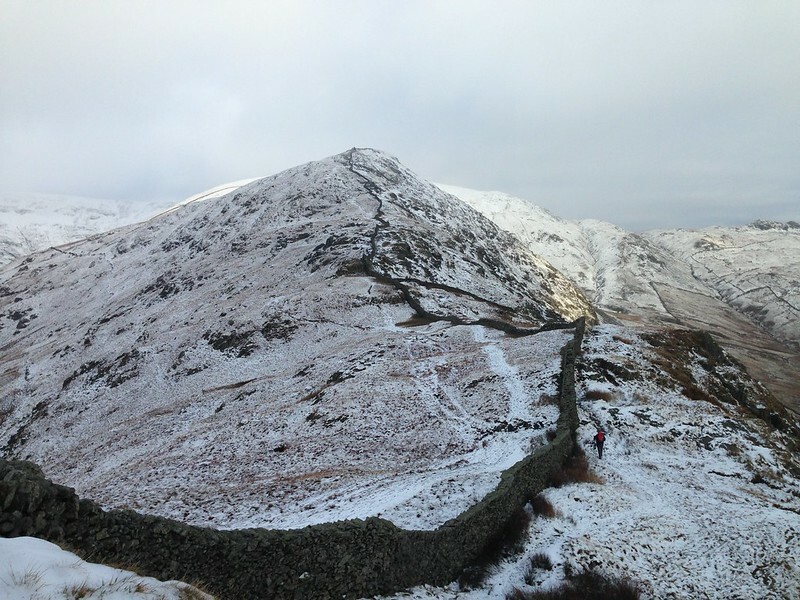 The long steady pull to Dove Crag from High Pike. Fairfield behind. I want to call this snow/ice on the wall rime, but I’m not sure that that’s the correct term. 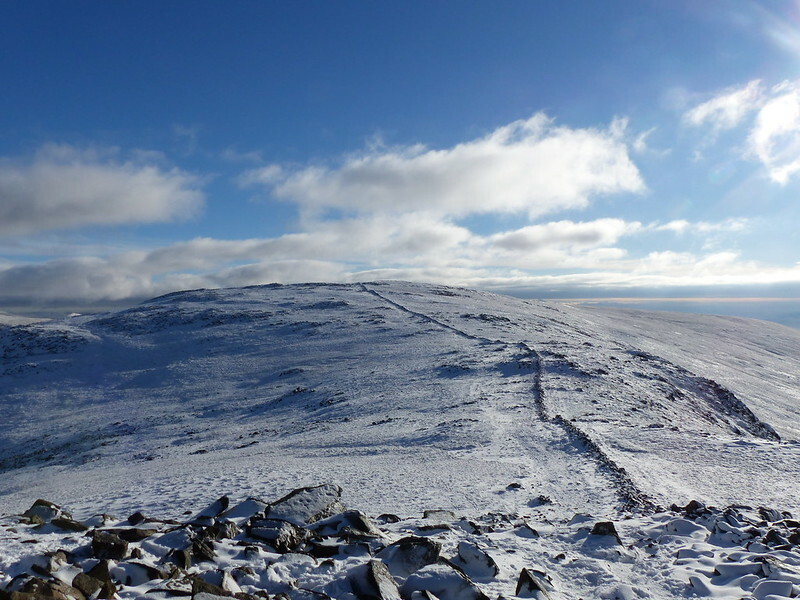 There seems to be a paucity of terms to describe snow and ice features in English, so that we often have to use terms from other languages – névé from French or sastrugi from Russian for example. 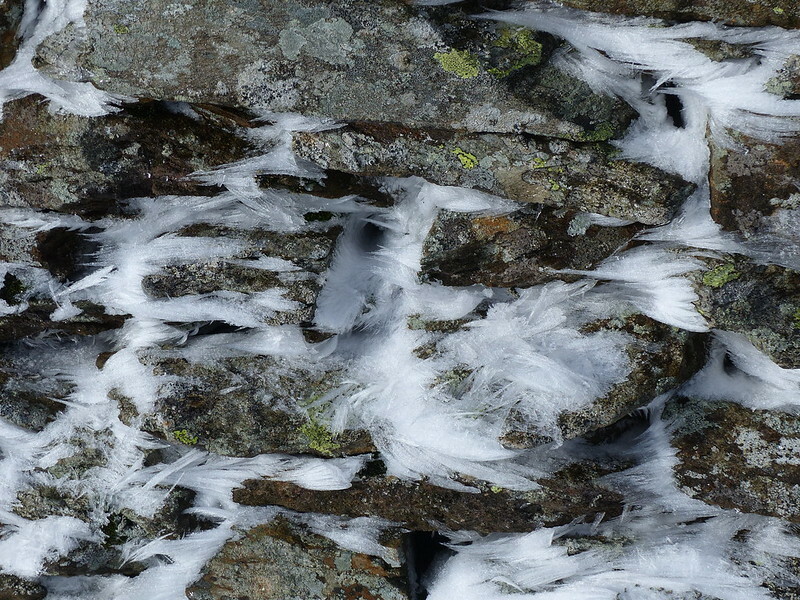 I suspect that these beards of snow are the result of snow being forced through the wall by strong winds and building up these shapes on the lee side. With the sun really shining now, I stopped for more tea. 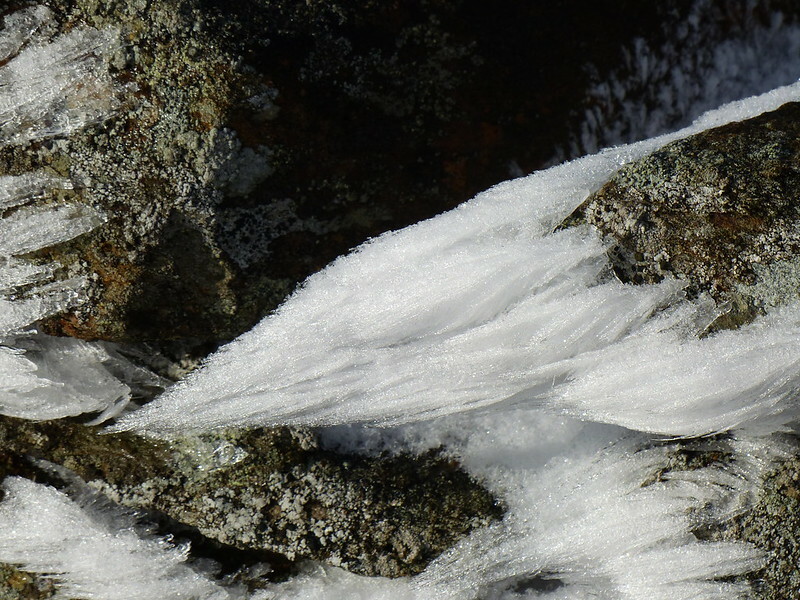 Out of the wind, it felt quite warm and I enjoyed sitting in the sun and listening to the drip of the snow melting. 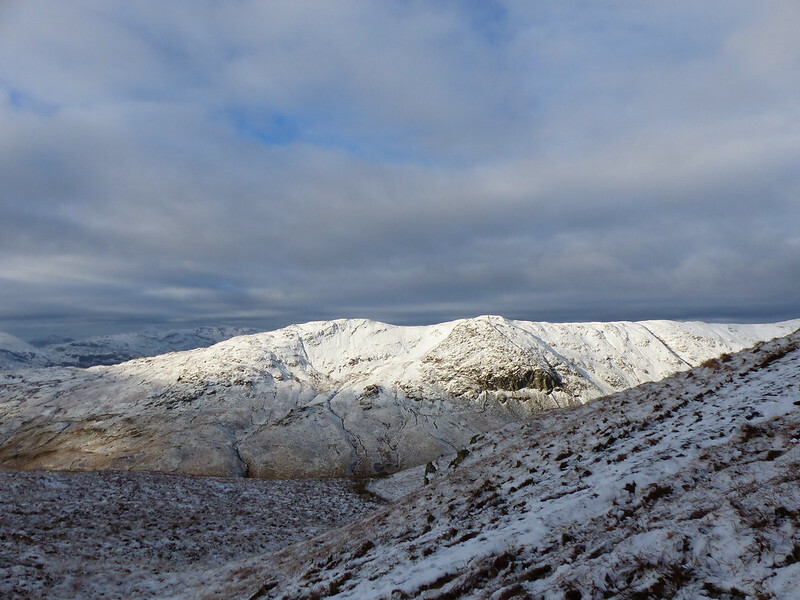 Looking back to Dove Crag. 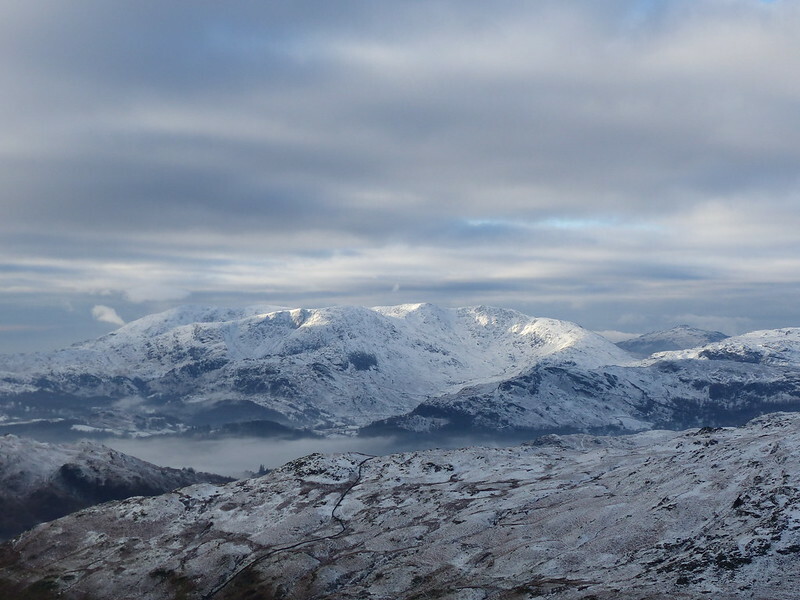 Great Rigg and Rydal Fell. The horseshoe and Rydal Beck. 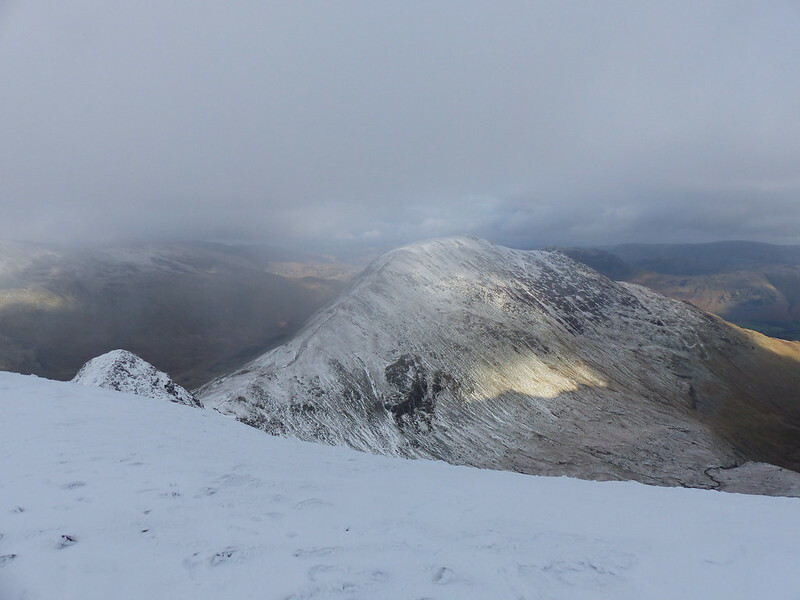 Cofa Pike and St. Sunday Crag. The cloud, as you can see, was coming in quickly, which it had been threatening to do for a while. 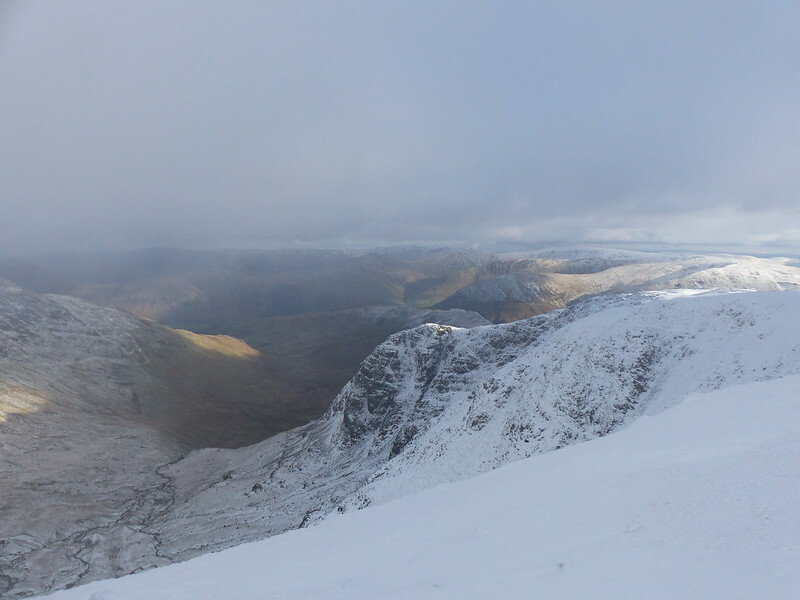 There was briefly a view of all of the fantastic ridges on the Helvellyn massif. I would have taken a photograph or two, but just at that moment I met an old friend who was walking the horseshoe clockwise with a small group and we stopped to catch up whilst the mist descended around us. 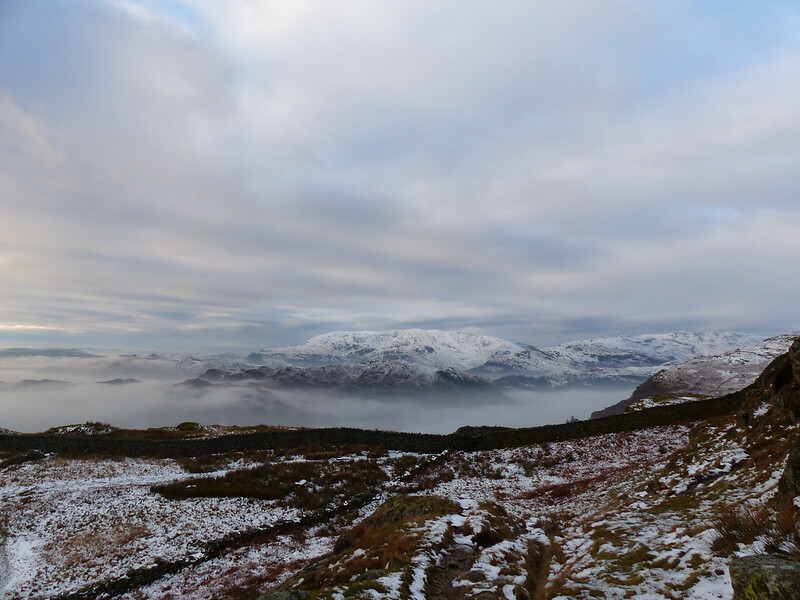 I was over Great Rigg in thick mist with no views at all, but then dropped below the cloud as the ridge descended. Somewhere hereabouts I found another sheltered spot where I could hunker down and eat my lunch: cabbage and chorizo soup from another flask, the warmth of which was most welcome. 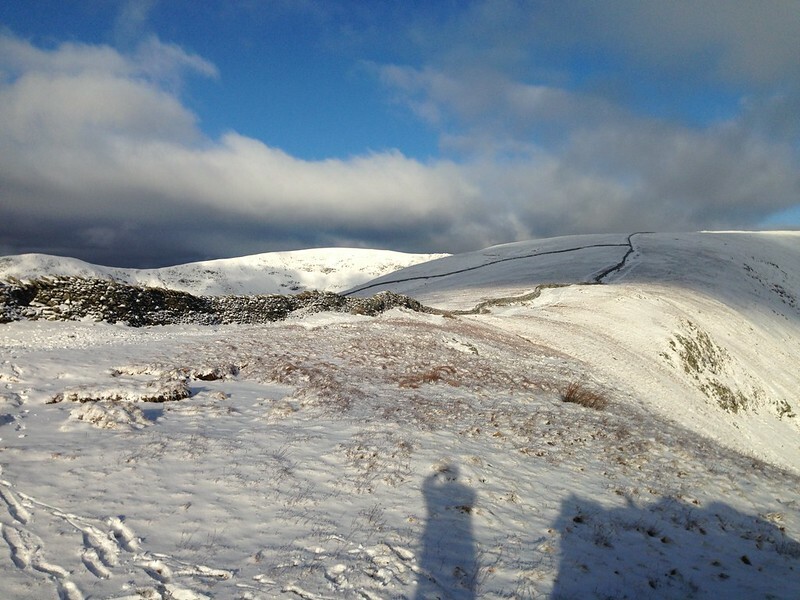 Rydal Fell and Heron Pike. The cloud was swirling across the ridge, alternately hiding and revealing the view. The photograph above came after numerous frustrated attempts when the clouds made the ridge ahead vanish at precisely the wrong moment. I took a photo from almost the same spot only last summer. Although I haven’t walked the entire round for many years, I’ve often visited some of the individual tops in the meantime. Unusually, I know exactly when I did last walk the whole horseshoe, because it was the second hill-walk which TBH and I did together. 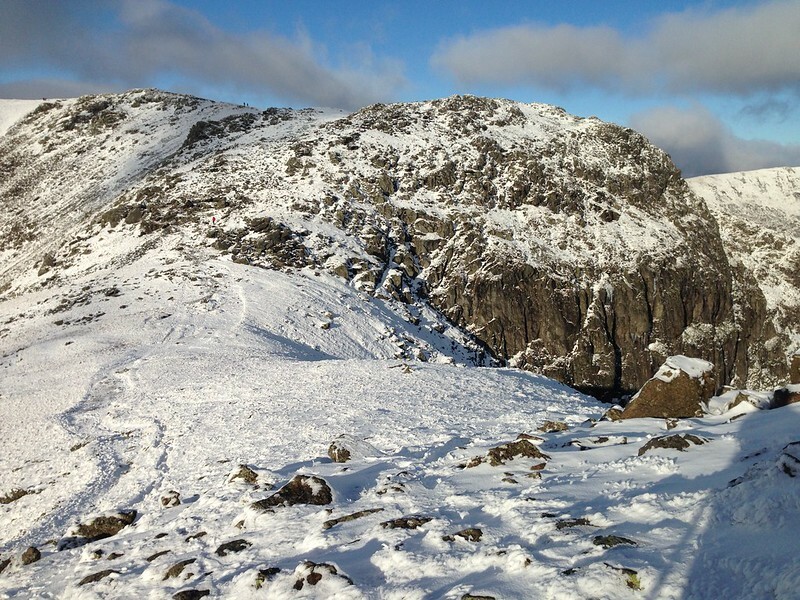 (The first was the Langdale Pikes via Jack’s Rake on Pavey Ark.) Which dates it as early in the summer of 2000. 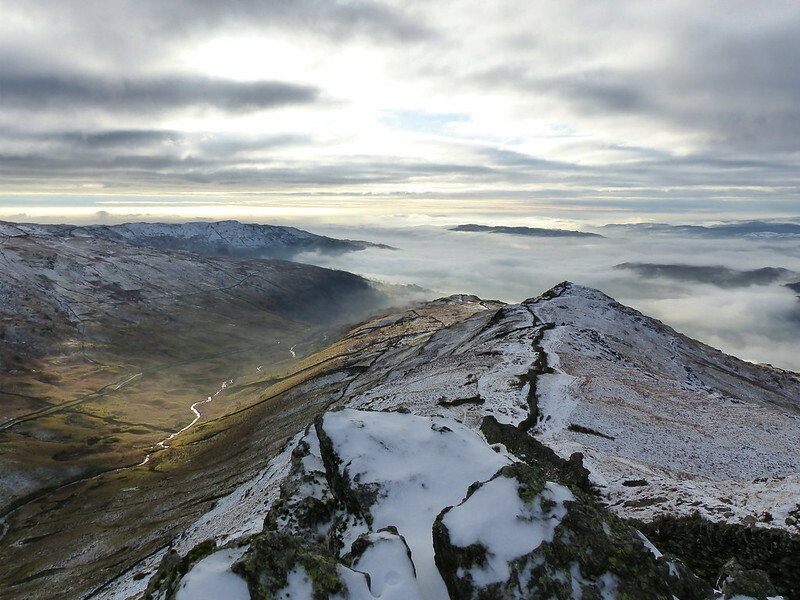 Heron Pike and Windermere (now mist free) from Rydal Fell. 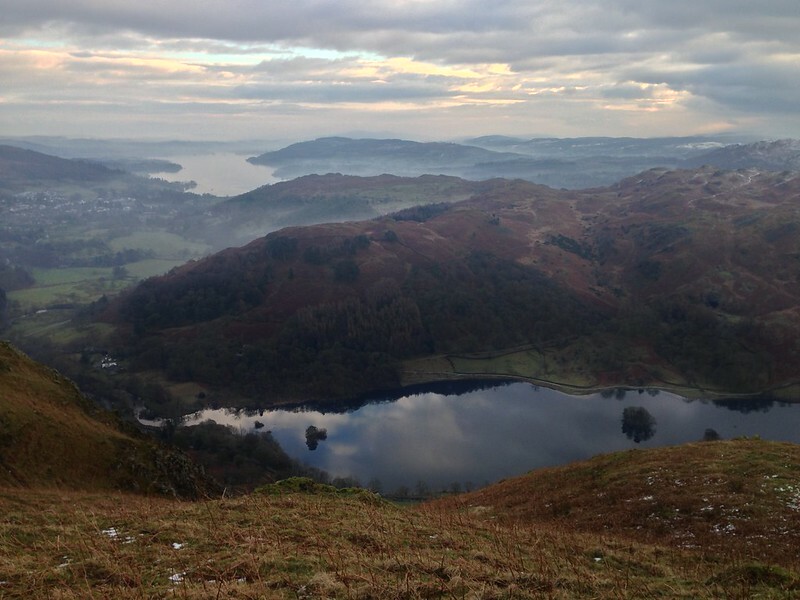 Rydal Water, part of Loughrigg and Windermere from Nab Scar. On the lower slopes the snow had turned to slush and for a while the going was tediously slippery. 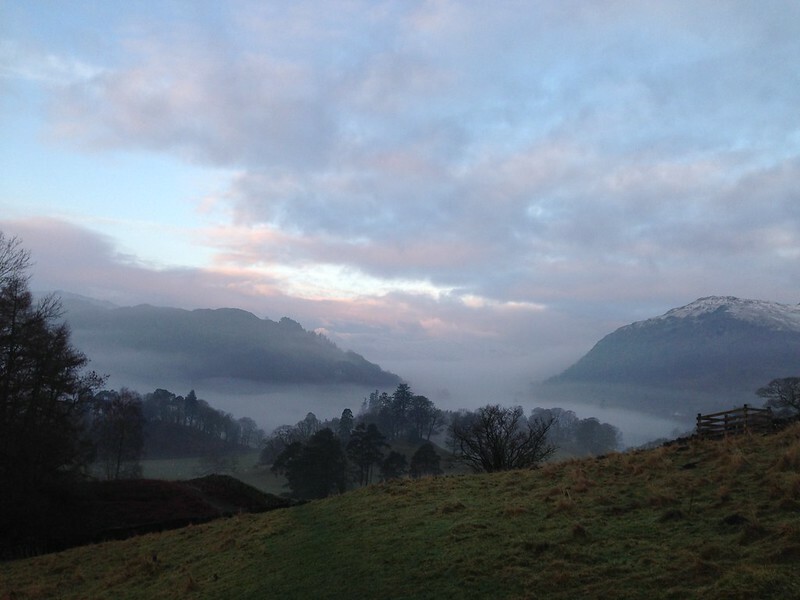 By the time I met my friend again, on the track through Rydal Park, it was beginning to rain a little and it was almost dark. It had been a long day, but very satisfying. Bill Birkett gives 10.25 miles and 1045m of ascent for this route. Mapmywalk gave 14 miles, but only 957m. I don’t suppose it really matters which is right, although the magnitude of the discrepancy is a bit alarming. And the rugby? They won. And survived without me, funnily enough. If I could guarantee a day as fine as this one, I might even be tempted to miss another match at some point. 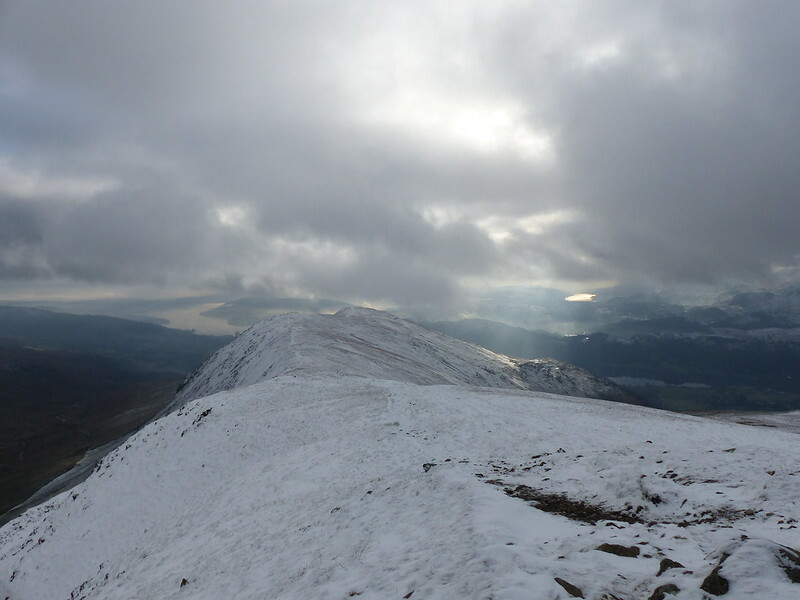 There were quite a lot of fell-runners out when I did this walk, but that nearly always seems to be the casein the Lakes these days. On the few occasions when I’ve tried my hand at fell-running, none of which was at all recent, I found that it was mostly walkers who seemed to feel compelled to shout things at me, not always very polite things, but then I knew that I made a most unlikely looking fell-runner. Wow! I have just been to heaven and back. Thank you. What an awesome hike, day and photography. Thanks Helen. 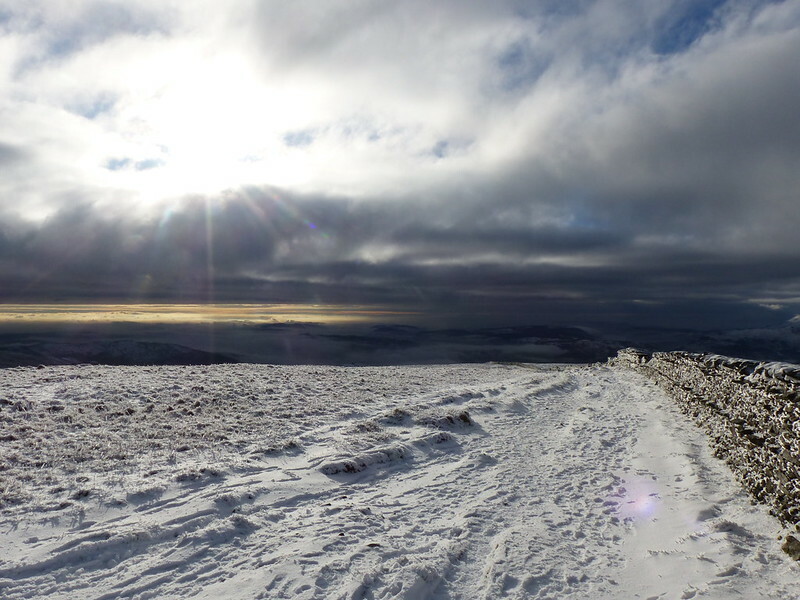 It was a tremendous day, made all the more satisfying because it was doubly unexpected: I hadn’t really expected to have an opportunity to get out on the hills and the forecast hadn’t been very promising at all. A series of great photos, makes me want to repeat the horseshoe soon. That shot of a seriously looking remote Scrubby Crag brought back memories of climbing there, a number of hard routes with names related to Beowulf. We spent one afternoon rescuing a couple of lads off Hrothgar when one had fallen and damaged his leg. Safely back on the ground he had a long hobble out to Dunmail Raise where their car was parked. We did another route, Grendel, and strolled down Deepdale. That’s a fair old walk on a gammy leg. I fell off an improvised log bridge at the western end of Loch Mullardoch and badly sprained my ankle many years ago. The walk out, the following day, on a very swollen and painful ankle was not an experience I shall ever forget or want to repeat. Scrubby Crag requires the kind of commitment that climbers don’t seem to have anymore, now that climbing is more a form of gymnastics than an outdoor activity. That was an ambitious walk for a winters day! 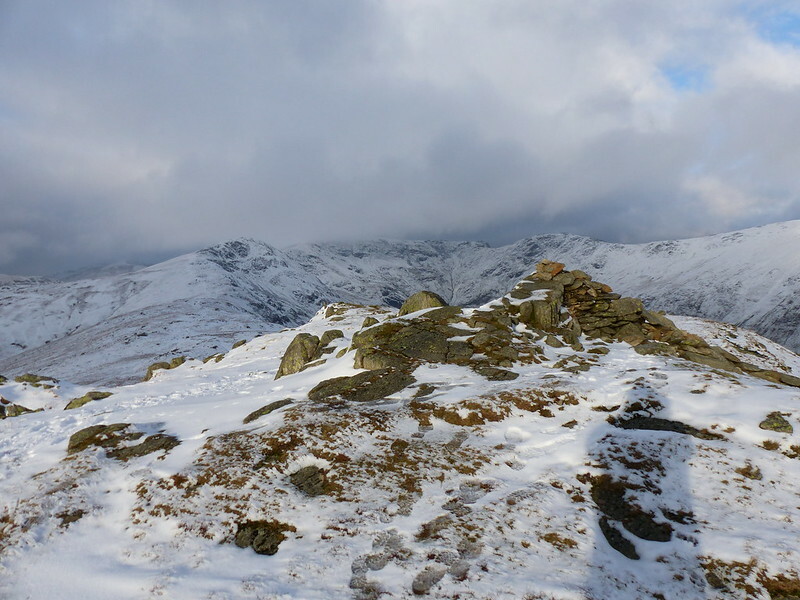 The fells look great with a covering of snow – not too deep to make the walk more challenging. There’s a part of me that completely agrees about that being an ambitious walk, certainly relative to most winter walks I do these days. And then there’s another part of me that still harks back to long ago days in the Mamores, or the Fannichs or on the long ridges around Kintail and dismisses these walk as merely frivolous by comparison. I wish I was half as fit now as I was then! And that I realised then just how fit I was, rather then comparing myself unfavourably to my leaner, faster walking companions. Sunday is looking pretty good. Sadly, I shan’t be able to take advantage of that. I think you’re right though, some times you will just have to grit your teeth and go if you’re going to get to the magic 1000. It’s hard to beat a classic horseshoe like this one. I need to get out again soon! Stunning, those early morning shots of the clouds are amazing. Probably one of the UKs classic horseshoes and under snow even better. Superb stuff! Yes, it was a terrific day. Roll on more like it! Just gorgeous! Thanks for sharing these photos! Thanks Amy, it was a highly enjoyable day. Once again stunning scenery, lovely pics and engaging description of your walk. I’m not getting out half as much as I’d like and def. not to anywhere nearly as wild as yourself…. 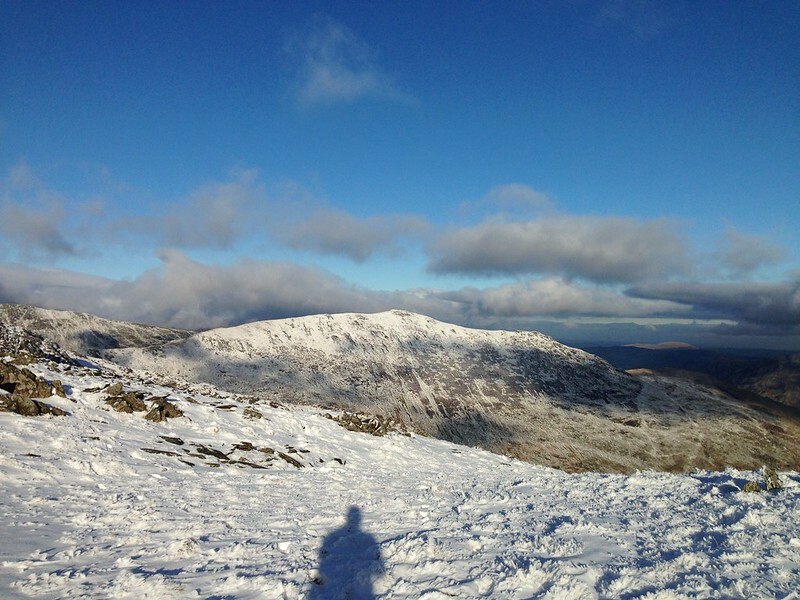 bring on the lighter nights and a chance to grab some weekends in Wales or the Lakes.